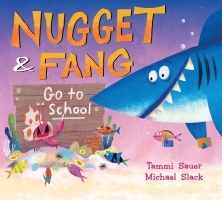 When Fang the shark is invited by his friends to attend Mini Minnows Elementary, he thinks it's a great idea! But then his first day of school arrives . . . and suddenly, he's not so sure. He's not very good at reading or math. He doesn't exactly fit in with his classmates. And the teacher looks crabby! Can Fang's best friend, Nugget, and the other minnows turn things around and prove to him that school really is fang-tastic? This reassuring first-day-of-school and friendship story is full of heart and humour, showing that everyone feels like a fish out of water sometimes, and that it's important to be a good friend. Can a shark really fit in at Mini Minnows Elementary, or will he be a fish out of water? The popular undersea pals Nugget, a minnow, and Fang, a shark, are back in this first-day-of-school story that's full of heart and humour.